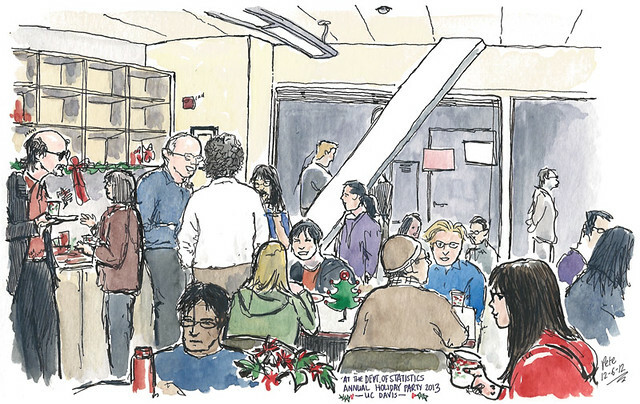 Yesterday was our department’s (Statistics, UC Davis) annual holiday party. In all my years there I’ve never sketched any of our department events, but this time I felt the need to. I usually decorate the whiteboard for the party in dodgy dry-erase markers (and did so again, with snowmen – easy to draw – and a leafless tree – took a bit more time), but I don’t have a decent photo of that so you’ll just have to imagine it. Technically it’s my largest piece of public art. I had meant to bring a trifle too, and I went to the store and got all the ingredients, and quickly cycled home eager to put together my favourite favourite dessert, and realised I had forgotten one important thing. No sponge cakes. Back home I’d use either Jaffa Cakes or basic trifle sponges, but here, among other things, I’ve taken to using Twinkies. Well you all know Twinkies are now consigned to the big bin-bag in the sky, but I had cleanly forgotten to look for an alternative (Ladyfingers I’m told are good, but I can’t ask for them without thinking of Alan Partridge gyrating around a pole), and so it slipped my mind. I won’t make a trifle without this aspect of it, so the trifle did not get made. I considered burning the other ingredients ceremoniously, but I decided to keep them and make a trifle on a different day. I will probably use Pims (a near-equivalent to Jaffa Cakes, not the stuff you drink on a hot day in Surrey). Still, the food at this potluck was amazing as always, and I particularly enjoyed the vegetable biryani. Very festive!